Distribution of income refers to the relative incomes that people have within an economy. For example, in the UK the poorest 10% of people have roughly only 2.5% of the nations total income. The richest 10% have approximately 35%. 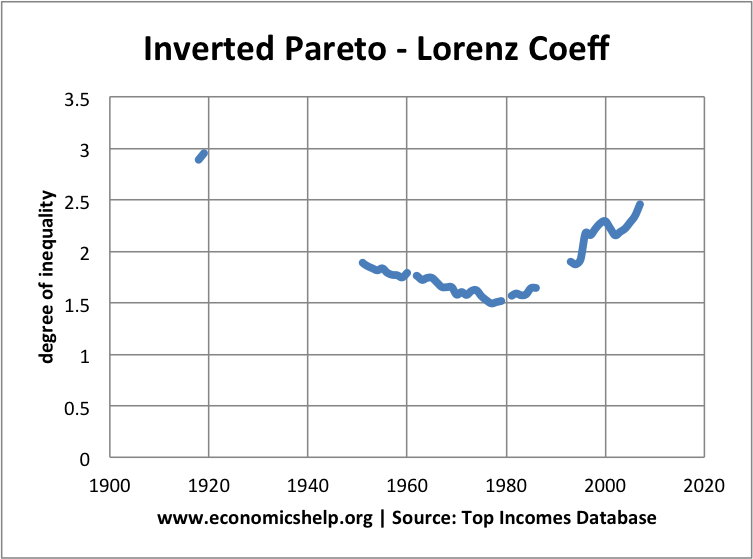 This suggests there is a degree of relative poverty because the richest have a bigger % share of income; this can also be illustrated with a Lorenz curve or Gini coefficient. The first reason for income inequality is because of differences in wages/ salaries. For example, the wages of unskilled catering workers will be much lower than for lawyers, this can be explained using economic theory. The supply of catering staff is quite elastic because no qualifications are required. 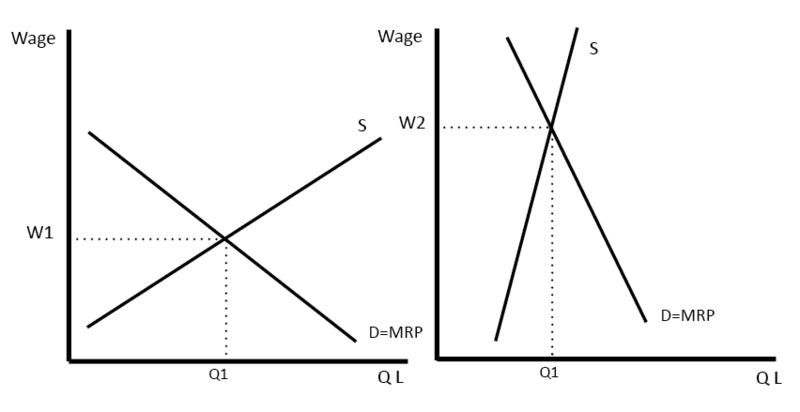 Demand for labour depends upon the Marginal Revenue Product =MPP x MR. The demand for catering staff is quite low because the productivity of a worker in McDonald’s is not too high; they do not add too much to the total profit of a firm. However, the supply of lawyers is quite inelastic because it is difficult to get the necessary qualifications. This limited supply means firms have limited numbers of workers qualified to work as a lawyer. This inelastic supply means workers can easily bid up wages. 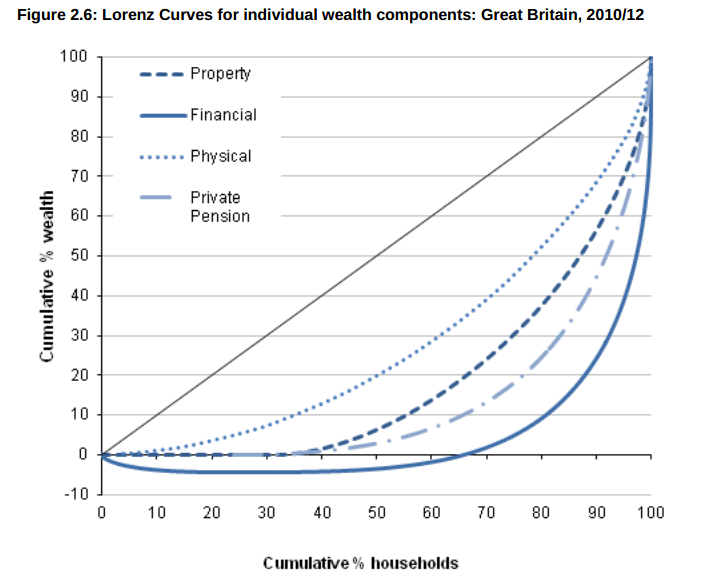 Wealth inequality in the UK – it shows the extent of inequality when using the form of wealth – especially financial and property. Income inequality could occur because of differences in wealth, for example, those who own assets such as houses can rent them and receive extra income; if you inherited money you could set up a business with the possibility of earning a high income. Those with no wealth will get no income from shares/housing or savings. The biggest cause of poverty in the UK is unemployment. Unemployment benefits are quite low, therefore, if you have no job then your income will be much lower than those who are in employment. Job seekers allowance is roughly £60 a week, this is significantly lower than average wages of around £450 a week. Another cause of income inequality could be age. Pensioners tend to have lower incomes as well; especially those who rely on state pensions will have an income far below the average wage. However, in recent decades, pensioners have seen a decline in relative poverty because of the increase in the state pension. By comparison, people of working age and children have become more likely to enter into poverty. 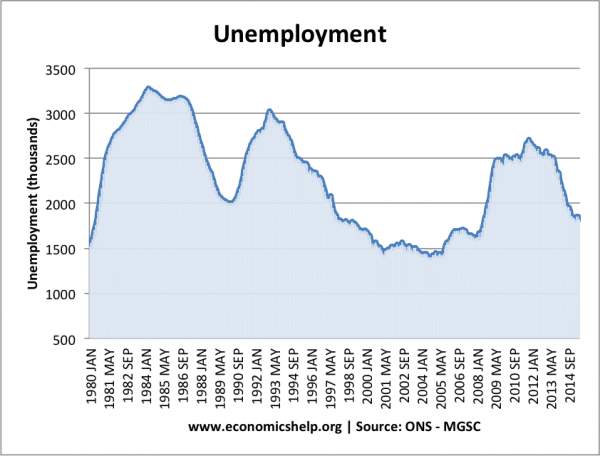 This is partly because state benefits, such as universal credit and unemployment benefits have become index linked. 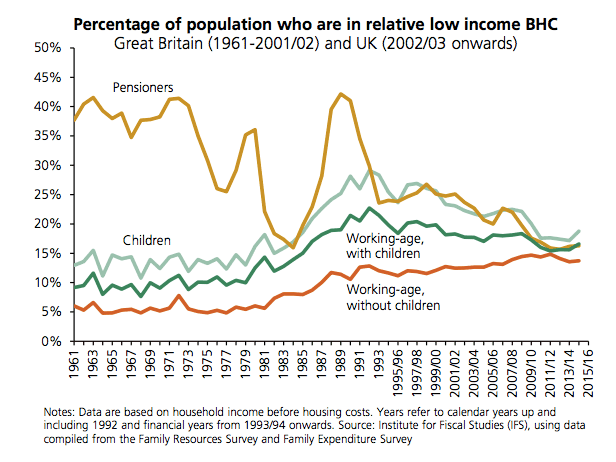 There are other groups of people who rely on state benefits and these will tend to have lower incomes, e.g. single mothers and those on disability allowance. This is higher than unemployment benefit but still lower than average wages. In the UK those who work in the public sector e.g. nurses and council workers tend to have wages lower than comparable jobs in the private sector; the government is more reluctant to increase wages of public sector workers. The gap between public and private sector has increased since 2010 and the government’s strict pay freeze for wage rises. Also, poorly paid jobs are often found in the service sector, e.g. there are many part-time jobs in catering and cleaning which pay close to the minimum wage of £7.50. Women predominantly do these jobs. In recent years, there has been a growth in part-time, temporary work. These service sector jobs tend to be lower paid than old manual work in manufacturing. Unskilled workers have seen lower wage growth in the past two decades. Another factor is the number of hours worked. In the UK, there is a degree of underemployment – people who would like to work full time but find themselves on zero-hour contracts, where there is no guarantee of a certain number of hours. Wages tend to be higher if the industry has powerful trades unions. In the past two decades, we have seen a decline in the strength and density of trades unions; this has been a factor in increasing wage inequality. One factor to consider is not just the income people receive but their living costs. For example, if you have high rent and transport costs, this reduces your disposable income and reduces living standards. Though this question only asks about income inequality.